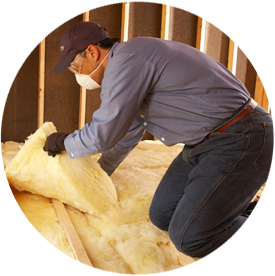 If you need an insulation company in southeastern Virginia, Tidewater Insulators is the company to call. We work with homeowners and builders/contractors to install blown-in insulation in homes and commercial buildings, for both retrofit and new construction projects throughout Hampton Roads as well as Richmond. Contact us if you’re ready to begin your insulation project, or keep reading to learn more about blow-in insulation! “Blown-in” refers to a method of installation—blown-in insulation is installed with a special blowing device. Fiberglass is available in blown-in form, and cellulose is as well. Blown-in cellulose is also called loose-fill cellulose. At Tidewater Insulators, we install blown-in insulation in walls, ceilings and floors in homes throughout the Norfolk, Hampton Roads, Virginia Beach and Newport News areas. If you’re in the Tidewater region in Virginia, look to our experienced team! Tidewater Insulators uses blown-in (loose-fill) insulation from top manufacturers in the industry and look forward to helping you with your project. Being a part of the Installed Building Products family of companies, we offer knowledge, experience and resources that few companies can match. Get in touch with us to learn more about our insulation services or if you’re ready to start your project—call us at 757-828-0024 or fill out our contact form!